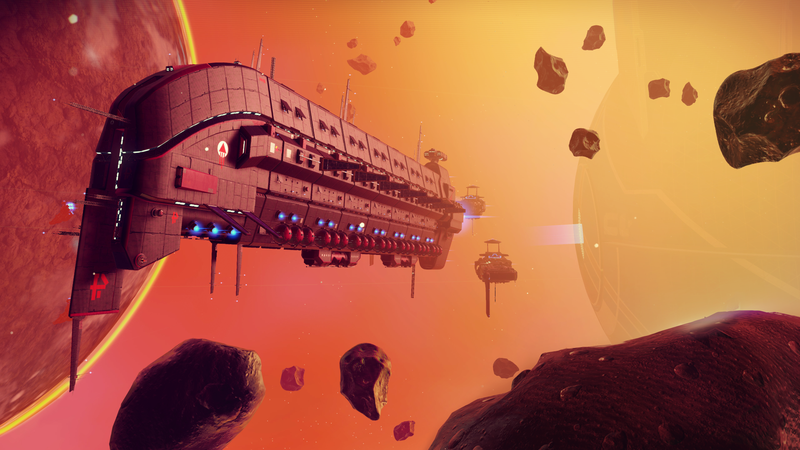 As No Man’s Sky players gear up for Next, the big update coming in July, they’re readying their communities to welcome new players. For some, that means making new shareable farms and laying out community guidelines. For others, it means creating an intergalactic police force. In the current state of the game, it is possible for communities of players to wage war by passive aggressively naming planets or building bases, but no one’s been able to shoot at another player and take their stuff before. If that does come in the next update, players who participate in communities in No Man’s Sky want to be prepared. The average player might never even see another player, but players who are part of the Galactic Hub, a project meant to catalogue and civilize a corner of No Man’s Sky space, are around other players all the time. The size of the community, as well as its notoriety, has many Hub members worried they’ll be a target for PVP attacks. The Galactic Hub Twitter account has already started getting some vague but threatening tweets, and there have been outright calls to create chaos in the Hub on reddit. The community was overwhelmingly in favor of creating a police force. Although topics discussed in the post ranged from “how do we as a community preserve our communal way of life?” to “what should we call our space cops?” the community was very enthusiastic about using the latter to enforce the former. So far they’ve received 75 applications for what they’ve dubbed the Galactic Hub Defense Force. They have begun setting up Discord channels for the space cops to congregate, as well as where they’ll receive the future distress signals they’ll be responding to. After surveying the community, Hub members decided on the official role of the GHDF. “The GHDF act as public servants and protectors of the Galactic Hub population,” the Galactic Hub wiki states. “The GHDF may occasionally act in matters outside the Hub, such as defending another civilization from an organized attack.” They even decided on an official ship and color scheme for Defense Force members. Before the update in July, the Galactic Hub Defense Force will be doing a whole lot of nothing—they won’t even be able to train together until multiplayer is live. However, creating space cops in anticipation of these changes has made community members a bit less nervous. The last time the game had a big update, the Hub had to move locations and start over because the changes to world generation made their previous planets uninhabitable. All that might happen again, with the additional potential danger of hostile players. No matter what happens, Krycek told Kotaku that players should stock up on money and ammo.